Well, the theme around here this week is looking back over the photos from last year. 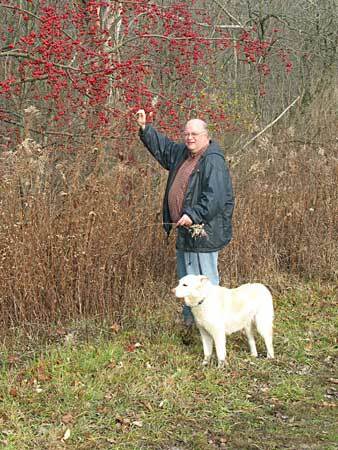 These were from November, 2010 – the leaves had already fallen, everything was ready for winter. The day itself was crisply cold, but the sun was out and keeping us warm. This trail is a section of the Hinkley Hills Loop Trail that I wrote about recently. In contrast to that rugged area, this portion is very flat and meanders through meadows and the edge of the woods. 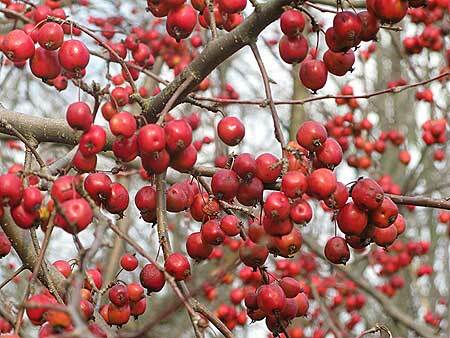 There were numerous crab apple trees with their vivid red fruits. They sure stand out from the surrounding gray branches. 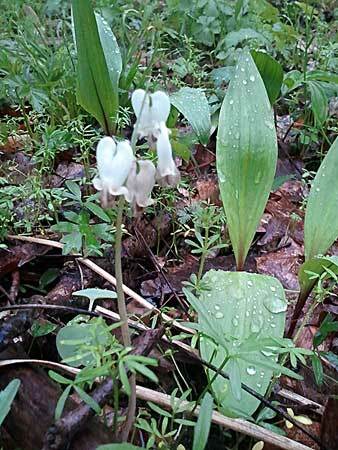 While sorting photos, I found some shots of one of our many hikes in Hinckley Reservation. last summer. We have walked there often in the last couple of years, and late last spring we discovered how nice it was to walk the bridle trails. We frequently encounter the horses and always get the dogs well off to the side and make them sit. One time, after the they passed, the horses began to run. This made Spike very excited and she wanted to run after them. The remainder of the hike, she was very animated and was bouncing all over the place. It really tired her out and she was a little stiff the next day. 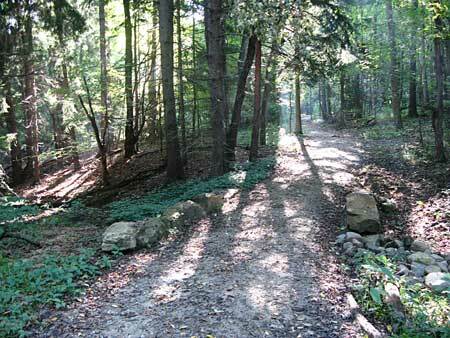 Here is a view of the Hinckley Hills Loop Trail near the Kiwanis trailhead. 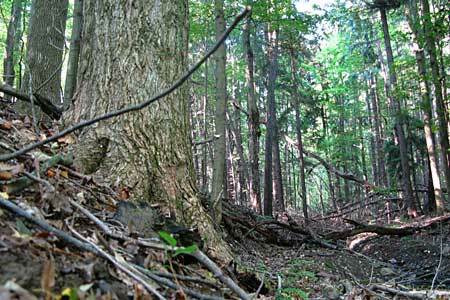 This rugged trail crosses ravines and streams and follows sections of the Buckeye and bridle trails. Yep – that describes it. It’s rugged, and the path is confusing sometimes. We got lost several times before we were familiar with the area. We have talked with several other hikers and they mentioned helping out lost hikers at times. It’s not “deep in the woods” lost, just “how in the world do I get back to where I started” lost. 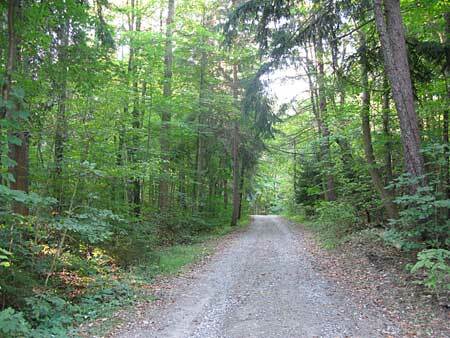 Here is a photo of a bridle trail loop. I can’t remember the name, but it was *really* rugged. 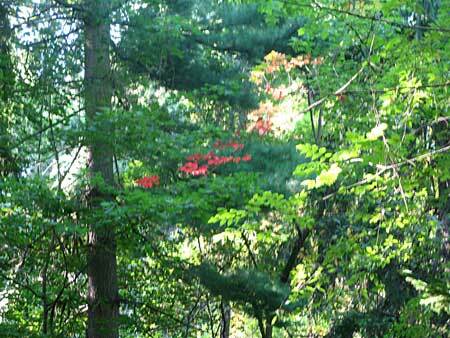 I remember being excited seeing the start of the leaves turning color. Rosemarie Hanus melts glass to make beads in northeast Ohio. In her spare time she love to hike the local trails. My name is Rosemarie Hanus and in my home studio I produce handmade artisan glass lampwork beads. 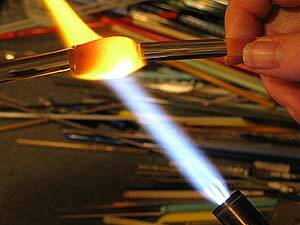 I do this by melting colorful rods of glass over a flaming torch and winding the glass onto metal rods. I like fire! 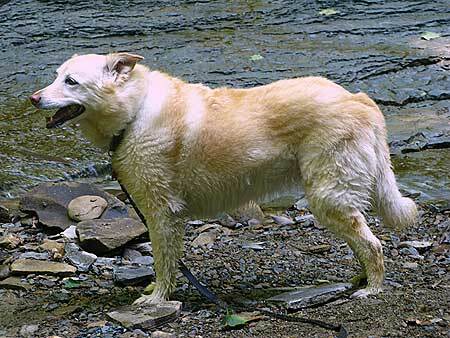 I also spend a lot of time hiking in local parks here in Northeast Ohio (USA) with my family and two dogs and love to share my adventures. I satisfy my music muse by playing French Horn in a local brass choir. I am participating in the fifth and final blog hop known as One World One Heart; this is a gigantic open house which allows bloggers from all over the world to mingle, meet, and make new connections. The blog hop is hosted by Lisa at A Whimsical Bohemian and the rules are here. This it the first time that I am participating – better late than never? I’m really looking forward to getting to know more bloggers. 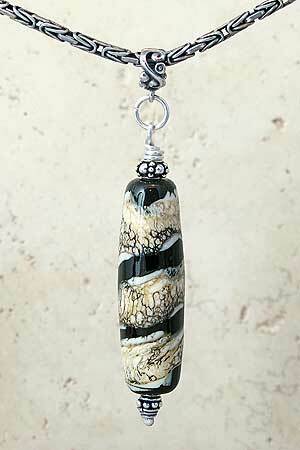 Someone visiting here will receive this gorgeous pendant made with one of my glass lampwork beads. This pendant is ready to be placed on a chain or ribbon for your wearing pleasure. (Lol at “wearing pleasure”). The chain in the photo is just for pretty – I’m keeping that. The winner has been announced here. I like to talk about my finished beads, beadmaking and my bead business (tips for others). I also love to share a little bit about my little part of the world – Northeast Ohio, USA. I try to share with the lampworking community; my most popular series of posts explain how to make a certain element (called Silvered Ivory Stringer) that is used to embellish lampworked glass. A couple of these posts even show FIRE! As I mentioned – I am definitely Pro Fire. 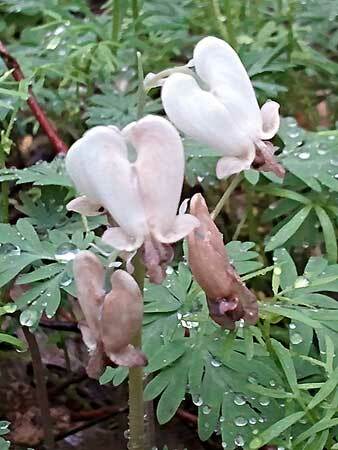 My family and I hike frequently and many of my musings are about what we see. 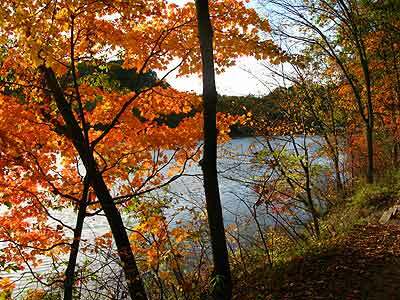 We frequent a local park called Hinckley Reservation. 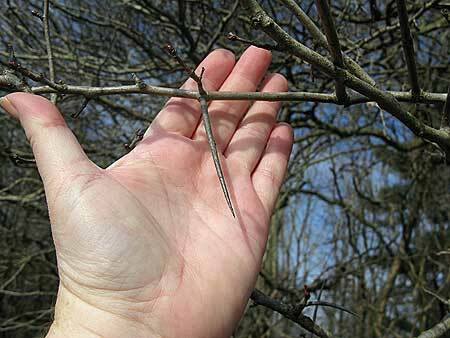 WARNING – there are pictures of wildlife, including spiders and snakes; if you don’t have a problem with that, take a look at some of these posts (there are several pages!). Please have a nice time looking around and remember to leave a comment! We went on a hike today – one which we have not done for a long time – to see two waterfalls in the Cuyahoga Valley National Park. 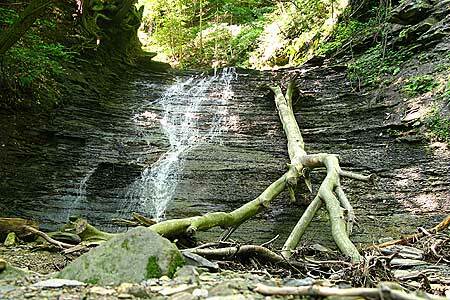 It is a very short hike to the first waterfalls, Blue Hen Falls and another mile to the second, Buttermilk Falls. Blue Hen Falls is about 15 feet high; here is a view from the top. The trail was not quite what I remembered. We had to cross the stream 3 times, I thought that only used to be once. At one point, there was a lot of erosion, leaving the trail right at the edge of a drop off. We decided to take an alternate path around that! I took lots of pictures of mushrooms; I was bending over when Paul noticed some friends right next to us. This nest was right at my eye level; we were wondering how we did not bump into it! 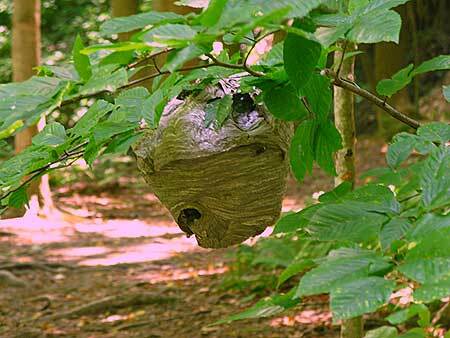 I don’t know if they were wasps or hornets… We quickly left the area. 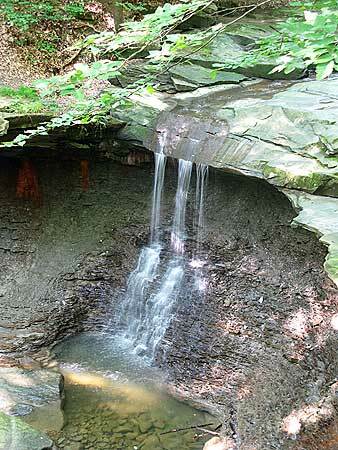 Here is Buttermilk Falls. It is very secluded and is about 20 feet high. At my last visit, there was a small pool at the base of the falls, but erosion has filled that. It was very much worth the walk. Well, except maybe for the off trail jaunt that we had to do. Spike loved the experience. She jumped into the water with exuberance! 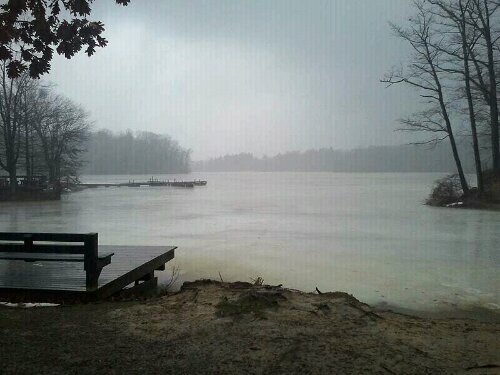 We went on a hike on Friday at the Hinckley Reservation;. It was what we call a glorious Akron day – overcast, damp, and cool. This is typical weather here in Northeast Ohio, and I guess that I have learned to appreciate this type of day. I disturbed a Great Blue Heron. I must have taken just a little too long for his comfort to frame the shot. He indignantly flew to the other end of the reservoir. 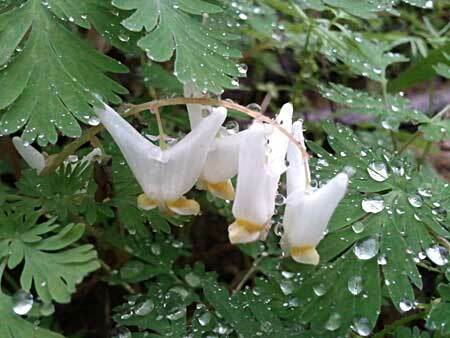 The dampness brought many tidbits to my sense of smell. The woods smelled of freshly decomposing leaves. 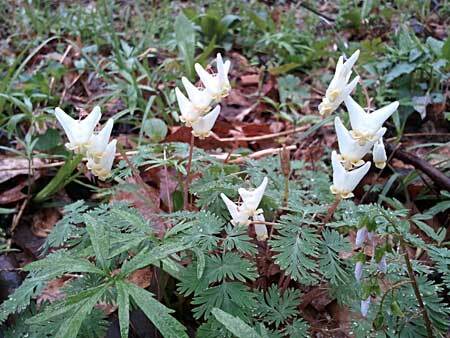 It was a clean, earthy smell – quite pleasant and reminds me of why our vegetation is quite lush this time of year. The air also hung heavy with the scent of wild roses. They smelled quite sweet right now, but not cloying at all.